We've had an exciting few months, meeting local suppliers, contacts and friends. Here's a quick overview of what we've been up to! We're so lucky to have met so many lovely people throughout our journey in Norfolk so far. We've met some of Norfolk's finest chefs, including Charlie Hodson and Richard Bainbridge, some amazing suppliers including the Coxford's boys Johnny and Jason, Jamie Archer and Mark from Dingley Dell. On the wetter side, we've confirmed our wine supplier, Rob from CH Wine Merchants, former sommelier at Morston Hall and met the lovely Wild Knight team and the guys behind Lacons brewery. Thank you to everyone for all of your advice and support, we couldn't do it without you! We are very proud to announce that we are now part of the Proudly Norfolk Scheme. We are so passionate about using the best ingredients that Norfolk has to offer. As part of this, we were invited to do a chef demonstration at the Norfolk Food and Drink Festival on Sunday 18th June. After some dutch courage, chef director Dan made his way on to the stage for his debut food demonstration and he went down a storm with the crowd! Using the best of local produce, Dan created braised pork cheeks, cooked in local cider with delicate spices and then prepared local carrots in four different ways, pickled, pureed, cooked in foaming butter and a carrot sauce. We've also been extremely exciting at Socius HQ as we've accepted the delivery of our very first batch of bespoke leather branded Socius aprons. These will be showcased for the very first time at a private event in a few weeks. As well as the apron delivery, we have received another shipment of our beautiful handmade crockery meaning that we now have a huge range available to use at our private events. 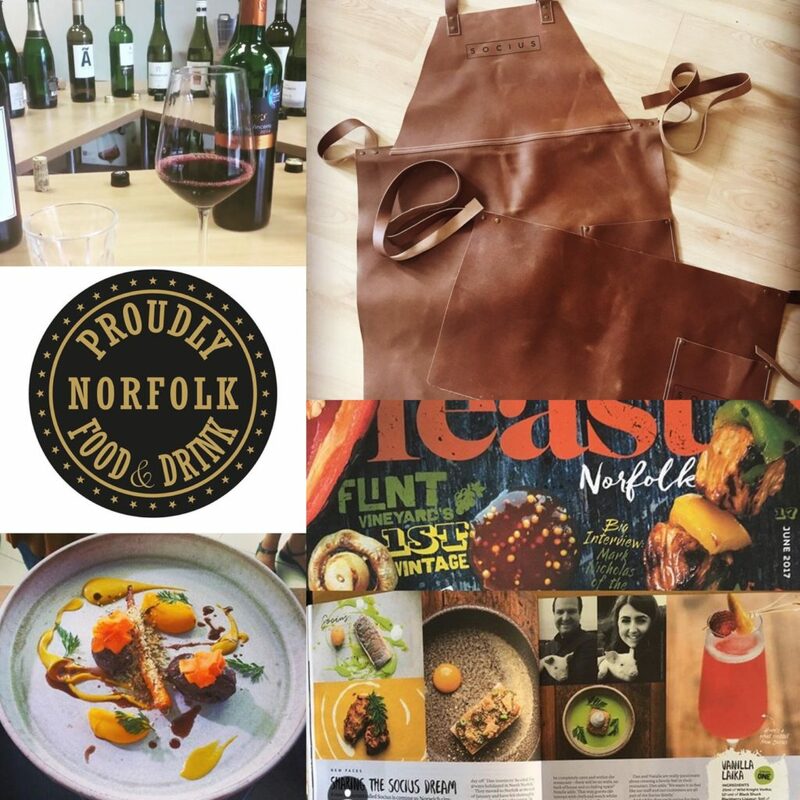 We recently featured in this month's edition of Feast Norfolk Magazine. Be sure to check out the article if you missed us (page 28-29)! We've teamed up with Robinson's Audi as part of their '90 Days 90 Prizes' to celebrate their 90th birthday to offer one lucky person a Socius dinner party for six guests. There's still time to enter so click here for more information! We are also pushing on with our premises search in the hope that the restaurant will open soon! We've looked at a number of exciting properties recently, including a few over in North Norfolk, so watch this space! We would just like to say a huge thank you to everyone mentioned above and everyone else we have spoken to for being so accommodating, nice and helpful on our journey so far! ← Welcome to the Socius Family….